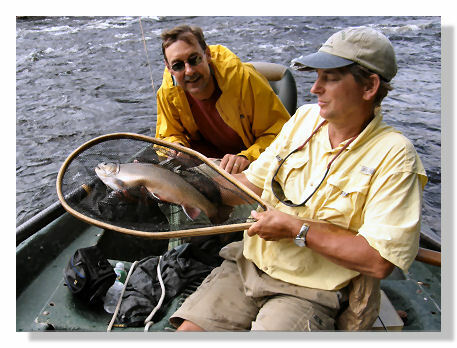 Our specialty is float fishing from aboard a drift boat which provides the angler(s) access to non-wadeable water. While seated comfortably upon padded swivel seats the angler is brought to within easy casting distance of formerly unreachable lies, often the home of large trout or salmon. With increased fishing pressure witnessed along the shore of most rivers 'fly fishing adventures' trips aboard one of our drift boats can transport the angler far from the crowds and into anther world. Fishing from a drift boat gives you access to fish that can be reached in no other way. 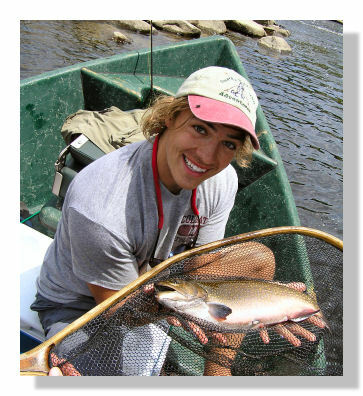 The fish being covered in this way have seen far less fishing pressure than those in areas accessbile by wading. Last but not least, drift boat fishing aboard the Osprey allows the angler tyo rapidly and effortlessly move from unproductive water to a spot with actively working fish. The source of the Connecticut River is a system of four lakes with magnificent stretches of water between them. 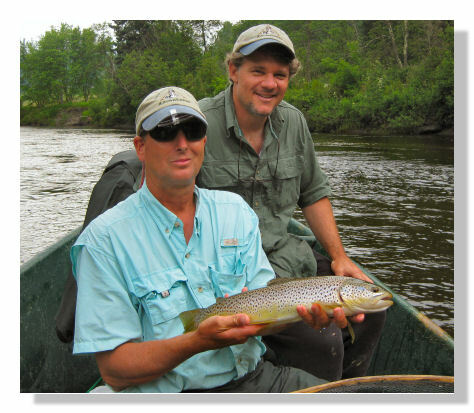 At key times of these can provide superb fly fishing and a host of memories to warm your heart during the long winter months. With the rivers bordered by majestic evergreens and/or flood plain forests sightings of wildlife are common. Deer, otter, eagles, osprey and a host of other wildlife make this habitat their home. 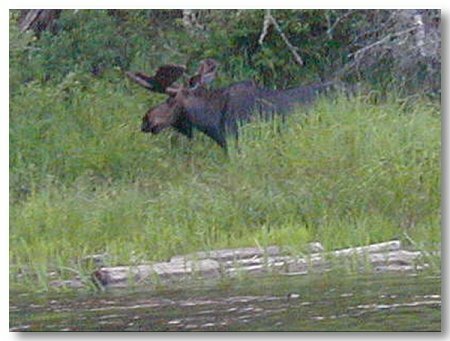 The chance but frequent sightings of a moose or bear swimming the river or along the shoreline adds an extra dimensionsto an already enjoyable trip. After meeting the guide at a prearranged location and time the gujest will be treated to a full day of matching wits with wild trout or salmon. Trips are tailored to the wishes and safety of the clinet and, with more that a dozen different floats available to them, the novice or expert seeking to learn or hone their skills will find these two rivers make an excellent 'classroom'. 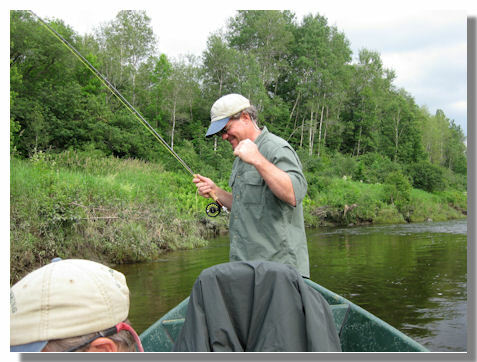 By request of some of our past clientle we now offer half day trips on the North Country's two mighty rivers. Whether you are trying to optimize a particular hatch or simple prefer fishing a shorter period of time this trip may fit your bill. 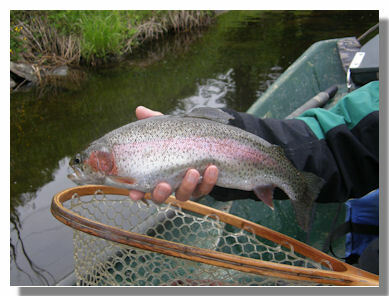 These fly fishing adventures trips will be limited to five and a half hours of tempting fish with your offerings. Perhaps the thought of fishing the 'evening hatch' or early morning sipping rises of the fish warm your blood. Unlike the full day trips lunches are not provided but instead are supplemented by complimentary snacks, water, and coffee all of which are included in the cost of the trip. Morning trips begin @ 8:30 AM while afternoon trips do so @ 2:00 PM. Some flexability is available at our discretion to suit the client's wishes. A guide fully aware of current hatches and/or local river conditions. 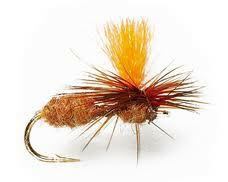 An excellent fly selection available to 'match the hatch'. A trip tailored to client's wishes and/or physical condition. 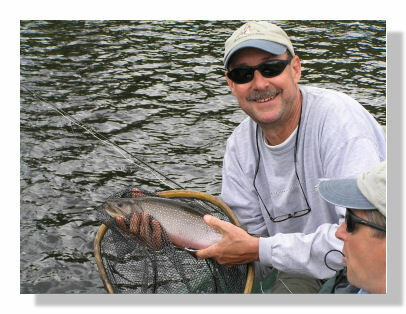 Fly casting instruction available prior to your trip at no additional cost. Magnificent scenery and the time to enjoy it. Ospreys I & II are Western style drift boats designed to carry a maximum of two anglers in comfort. Osprey II is the larger of the two dorys with knee braces both in the bow and stern and typically used for normal to higher water levels. Osprey I is the smaller of the two and has a knee brace only in the bow which is used either by a single fisherman or during low water conditions. From either of these boats the angler can cast safely from a standing position should they choose, and at the same time, methodically covering the choicest of fish lies in comfort. 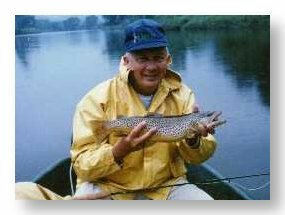 Whether due to water/weather conditions or by angler request we also offer 'wade trips'. 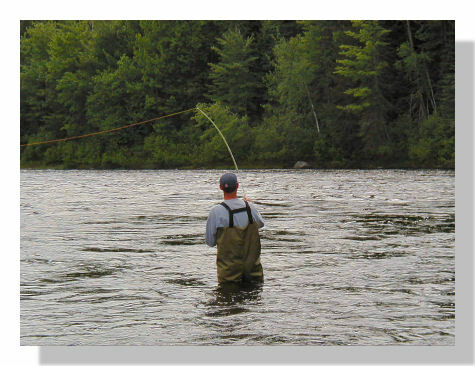 To many a fly fisherman there is no finer way to enjoy the sport then when standing thigh deep in a river being serenaded by the sounds only a river can make. 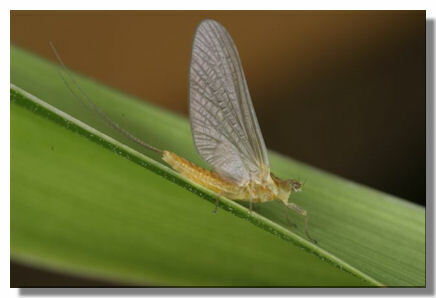 Wade fishermen should be prepared for wading moss and algae covered rocks in moderate to fast moving water. To assure angler comfort and safety we recommend either felt soled wading boots or those with interchangleable studded soles to prevent the spread of invasive species from one fishery to another. 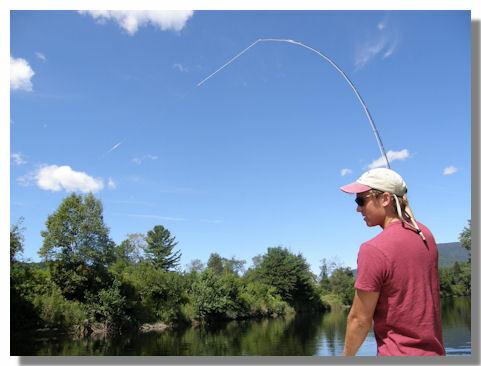 Both the Connecticut and Androscoggin Rivers can be difficult to wade at times with the fast current and slippery bottom. 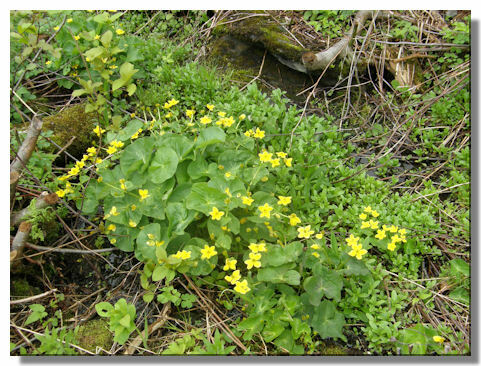 Water levels also fluctuate and therfore wading is not always possible. We reserve the right to shorten or decline to wade when conditions are deemed not safe to do so. 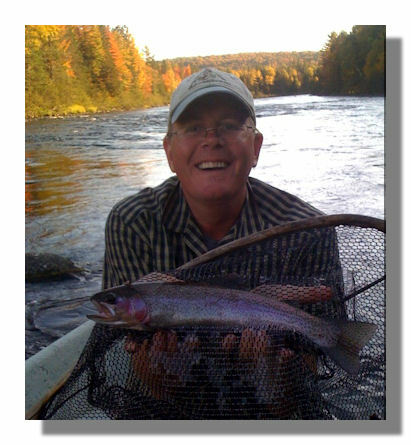 Whether the brawling waters of the 'Andy', the pastoral solitude of the Connecticut, or some combination of the two, this trip is sure to provide a host of memories and tales to exchange with friends. 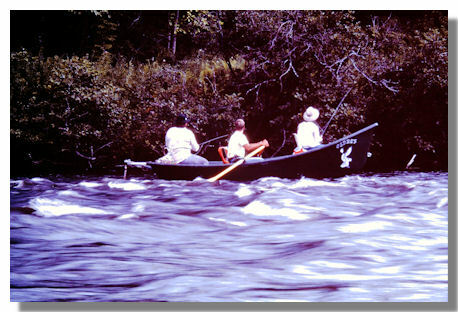 The likelihood of hitting the 'hatch' increases or having optimal conditions improves with three days versus one on the river.